Love all things steampunk? 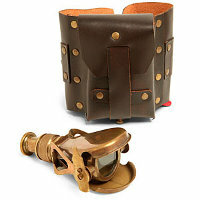 You might be interested in the Steampunk Wrist Monocular then, as this unique device will certainly let you live out your steampunk dreams, and heck, it might even help complete your costume for this Halloween. Bear in mind, this is not meant to be a replica or a piece of decoration, this monocular actually works. Yes sir, this is a fully functional, brass monocular that will feature up to 2X magnification – not too impressive, but better than no zoom at all, no? Heck, there is even a weathered leather arm-pouch that helps keep the monocular at hand all the time, and to make it even cooler, the monocular will open up via a lever movement. Yup, there is no need to press a button as folks tend to do these days, and being a steampunk device, you won’t get a touchscreen display, either. Would you fork out $44.99 for something like the Steampunk Wrist Monocular? Talk about looking into the future through the eyes of the past!